Voice call recording apps are quite popular in the Google Play store. Some of them have millions of downloads. 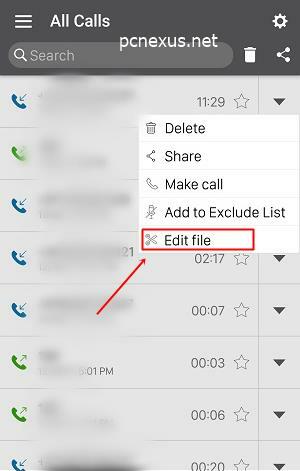 Call recording feature has now been coming as an integral part of the phone’s software in most android phones. But not all phones have built-in call recording feature. These are the android phones that use stock android OS. And call recording apps are such that they can’t guarantee 100% compatibility with every android phone. As you know Lenovo Moto phones mostly come with same and stock android OS. And I have checked that most call recording apps don’t work properly on these Motorola phones. During a voice call only noise is recorded and we can’t hear any recorded conversation. So most of the android call recorder apps in Google play store are useless for Moto phones. But we have found one app that it the only compatible call recording app available for Moto phones like Moto G4 Plus, G5 Plus, G5S Plus, Moto X4, Moto Z and Z Play. You don't have to root your Moto phone for running this app. The app’s name is ‘Call recorder’ but it is quite a useful app. It allows unlimited call recording and you can also protect it from unauthorized access using a pin/pattern. You can also trim voice calls and remove unwanted conversation and save them as new audio files. Its not a hidden phone call recorder app, it records calls in legit way. First of all download and install the app to your phone from the link given above. Open the app and tap the settings icon on top right corner to access call recording option. Here enable the options like 'Enable call recorder', 'Outgoing calls', and 'Incoming calls'. If they are enabled by default then no need to change anything. 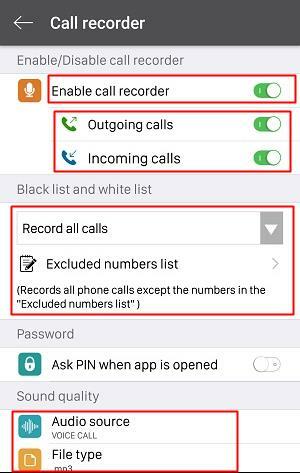 Under 'Black list and white list' either select 'Record all calls' or 'Only record some numbers'. If you select 'Record all calls' then all voice calls will be recorded. However you can exclude some number so that their conversation can't be recorded. To exclude any number tap 'Excluded numbers list' and then tap the '+' icon on top right corner. 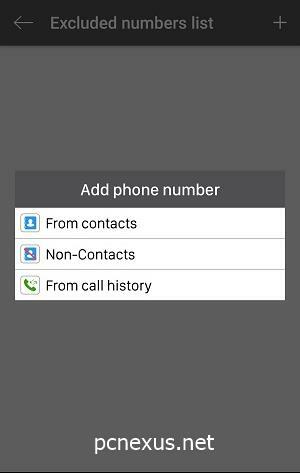 You will be given three options 'From contacts', 'Non-contacts', and 'From call history'. Select the best option and add the required phone number to the excluded list. If you are selecting 'Only record some numbers' then you have to specify those numbers. Tap 'List number should record' and then tap the '+' icon on top right corner. You will be given three options 'From contacts', 'Non-contacts', and 'From call history'. Select the best option and add the required phone number to the list. Under 'Password' enable 'Ask PIN when app is opened' and set your pattern lock to protect the app so that no one can view/hear your recorder calls. Under 'Sound quality' tap 'Audio source' and select 'VOICE CALL'. In 'File type' select '.mp3'. Under the 'Other' section you can select the location to save your recorded calls. You can either select external SD card. Open the app's main page where you will see the list of your recorded calls. Tap the tiny triangle in front of the file and tap 'Edit file'. A call editor will open like this below. The editor has two options 'Trim', and 'Remove middle'. If you use trim function that it will only save the trimmed part of the call. If you use the remove middle function then it will remove the selected part from the audio file. You can see two markers on the voice call in the editor. Long tap the bottom marker and increase the trim length by moving it back and forth. Long tap the top position marker and move it anywhere to select the desired trim part on the audio file. 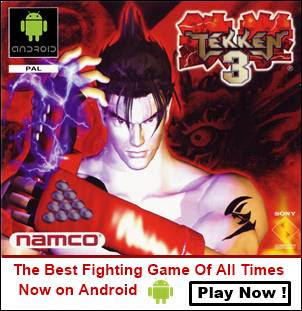 Before trimming or removing preview the selected part by tapping the green play button next to 'Try to listen to the result'. Finally tap the floppy icon to save the edited file. I hope you like the article. If you have any questions then ask via comments and take two minutes to share this article.